Presented by DBC Events and CU Cycling Club. Still 2 chances to sign up! Wednesday, April 3rd (no late fee!) Boulder Beer 2880 Wildnerness Pl. 80301 from 5-9 PM and on race day at 7:30 AM, if your category hasn't sold out. Starts at 55th and Nelson Rd. 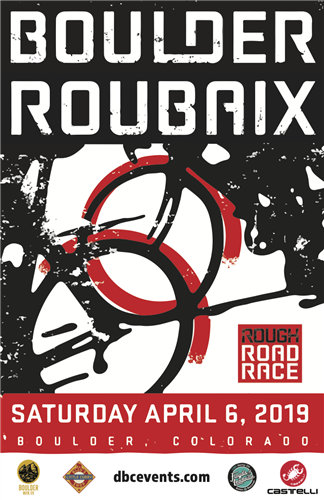 Interested in volunteering for the 2019 Boulder Roubaix Road Race? Sign up here and we'll be in touch shortly! The official poster for the 2019 Boulder Roubaix. Pick one up with your number on [+more] race day! **Poster orders are closed. **Poster is printed on 4 color 80# gloss cover.